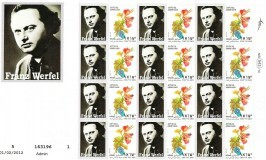 Stamp in Werfel´s honour issued in Israel. Werfel’s books were burned by the Nazis as those of a Jewish author who advocated pacifism, love for all mankind, and hostility to extreme nationalism and Nazism. Werfel had to flee Austria after the German annexation. He then escaped from France by hiding in the Catholic sanctuary of Lourdes, crossing the Pyrenees on foot to safety in Spain, and leaving from there for the United States. With gratitude for his sanctuary at Lourdes in mind, he wrote the best-selling novel, The Song of Bernadette. Though he remained a Jew all of his life, Werfel was attracted to many aspects of Catholicism.